NOW with DRcaps™ capsules (digestive resistant) to help protect our ingredients from stomach acid. We have improved our Tri- KRILL™. Also Superbakrill® is now improved their krill oil. Which is the only Krill oil we will use. More concentrated, Patented & Exclusive Technology, Made in the USA, Improved Smell and Taste, More Omeg-3’s, More Phospholipids & Choline. Certified 100% Sustainable & Traceable. Also now it has a new delivery system and in a Liqui-Krill™ capsule. We call it the Liqui-Krill™ delivery system. It makes the krill oil more stable, have less odor and no more leaking gel caps. What is it? It is a two piece veggie capsule specially designed for a secure leak-proof and airtight product! This is the most cutting edge technology for product integrity. Its unique look, "bubble in the capsule" stands for quality and stability. We strive to be one of the first in technology and quality. This new innovative way of stabilizing krill oil is the best way to keep it fresh. Remember we also give you 6mg of astaxanthin in one 500mg capsule. No one else has this great formula and patented procedure. DRcaps™ - A vegetarian capsule with unique properties that can slow down capsule opening after swallowing. Certified quality assurance system for traceability of raw materials. The most astaxanthin per serving than any other krill oil product on the market. Krill oil contains high levels of one of the most powerful natural antioxidants called Astaxanthin. Astaxanthin is a carotenoid molecule from the same family as beta-carotene, lycopene, and zeaxanthin, though astaxanthin appears to be more active in quenching superoxide, hydroxyl, and other radical species. Recent studies suggest that astaxanthin has anti-inflammatory action, inhibiting cytokine cascades in a number of trials of cardiovascular health, respiratory health, joint health, athletic performance, and others. Astaxanthins is what gives salmon its red color. Krill get their astaxanthin from small phytoplankton, their primary source of food. While krill contain natural levels of astaxanthin, we provide additional astaxanthin to our omega-3 krill phospholipid products. Acetylcholine is the neurotransmitter that is probably most well known for its involvement in Alzheimer’s disease. If we have adequate levels of choline, we support the acetylcholine neurotransmitter system, which protects attention, focus, memory, and even muscle function. What are Krill and where do they come from? Krill is the common name given to the Euphausiacea of shrimp-like marine crustaceans. Also known as euphausiids, these small invertebrates are found in all oceans of the world. The common name Krill comes from the Norwegian word krill, meaning "young fry of fish", which is also often attributed to other species of fish. Krill are found in all oceans of the world but harvested from the Antarctic waters and Southern Oceans. These small crustaceans fuel the oceans of the world. Krill feed on phytoplankton, microscopic, single-celled plants that drift near the ocean’s surface and live off carbon dioxide and the sun’s rays. They feed hundreds of animals from fish, birds and whales. Antarctic krill are among the largest of the 85 known krill species and can live up to 10 years. Krill oil contains omega-3 fatty acids, which is the main reason it's a popular nutritional supplement. Krill oil is contains an antioxidant called astaxanthin. The algae that krill eat produce the bright red pigment astaxanthin that gives krill and other crustaceans such as lobster and shrimp their reddish-pink color. Unlike fish oil, krill oil doesn't cause fishy burps or an after taste. Also, krill oil contains higher amounts of astaxanthin than fish oil. Disclaimer: Information found is presented in good faith with no guarantee or obligation as to accuracy and no assumption of liability. If you were to buy 6mg of just one capsule of AstaREAL® astaxanthin alone it would cost you an average of $39.95 just for that product. We include this amount in our Tri-KRILL™. This makes Tri-KRILL™ an excellent value. Astaxanthin has a significant protective role in nature. Astaxanthin is the red pigment that accumulates in commonly eaten seafood, such as lobster, salmon, trout, red sea bream, shrimp, and crayfish. Astaxanthin is a carotenoid, the same family of molecules found in carrots, tomatoes, and other colorful fruit. In fact, astaxanthin the most abundant carotenoid pigment found in aquatic animals and the marine world. Single-celled microalgae plants occupy the very bottom of the food chain, combining organic materials with sunlight to produce the vast majority of living material on the planet. Haematococcus pluvialis is one of these and it is the richest source of astaxanthin. What does astaxanthin do in nature? • Astaxanthin protects the highly concentrated polyunsaturated fatty acids found in cell membranes and muscles in salmon. These fats are the main energy powerhouse that enables salmon to accomplish their well-known upstream marathon to spawn. Salmon muscles contain the highest concentration of astaxanthin in the animal kingdom. • Astaxanthin is an excellent antioxidant, scavenging free radicals and thus regulating the process of oxidation in animals’ (and humans’) bodies. • Astaxanthin protects marine creatures, such as Antarctic krill, as well as the phytoplankton on which the krill feed (and human skin), against UV light damage. • In fish, astaxanthin is believed to have a synergistic effect on other important antioxidants such as Vitamins C and E.
Antioxidants like astaxanthin disarm dangerous free radicals before they have a chance to damage proteins, fats, and the genetic material of cells – damage that ultimately contributes to aging and underlies many disease processes, including cancer, heart disease, cognitive decline, and diabetes. Astaxanthin has extraordinary antioxidant properties, which has been demonstrated in numerous studies conducted throughout the past decade. Astaxanthin, like other carotenoids, sacrifice themselves in order to protect body cells. Carotenoids absorb the excited energy of singlet oxygen – a highly reactive form of oxygen that if left unchecked can directly damage fats, proteins, and DNA in the body. By sacrificing itself, astaxanthin prevents surrounding cells from being damaged. What is the difference between Phospholipid vs. Triglyceride Forms ? Krill oil is a unique source of omega-3 fatty acids, choline, and astaxanthin. One thing that differentiates krill oil from other sources of omega-3 is that, in krill oil, the fatty acids EPA and DHA are bound to phospholipids instead of triglycerides. This phospholipid form is structurally the same as our cell membranes. Moreover, these phospholipid forms are handled differently in the digestive tract. Phospholipids spontaneously form micelles, which can be transported easily in the aqueous environment. Phospholipids can be absorbed intact or in their lysophosphatidylcholine form. Triglycerides, on the other hand, are insoluble in an aqueous environment and require bile salts for their emulsification. While triglyceride forms of EPA and DHA remain valuable elements of supplemental nutrition, phospholipid-based forms provide unique benefits that, when coupled with added choline and astaxanthin, render krill oil a novel nutrient complex with significant clinical benefit. Beyond Fish Oil! 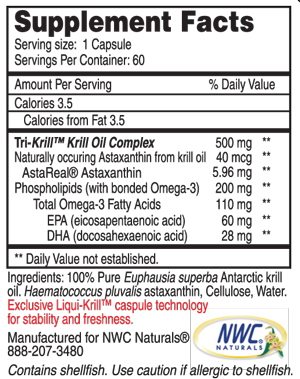 Tri-Krill™ contains an extract of Krill sourced directly from the Antarctic. Tri-KRILL ™ sourced directly from the Antarctic; which combines the power of Krill Phospholipids with 6mg of astaxanthin per new capsule. The highest of any krill oil supplement. Krill are found in all oceans of the world but harvested from the Antarctic waters and Southern Oceans. These small crustaceans fuel the oceans of the world. Krill oil contains omega-3 fatty acids, and contains an antioxidant called astaxanthin. Phospholipids with bonded Omega 3s. Phospholipids; are a class of lipids that are a major component of all cell membranes as they can form lipid bilayers. Common sources of Omega -3 fatty acids include fish oils, krill oil, algal oil, squid oil and flaxseed. The health benefits of the long-chain omega-3 fatty acids primarily EPA and DHA are the best known. Omega-3 fatty acids have been found beneficial in so many conditions. Heart disease, arthritis, cognitive decline, depression, anxiety, skin conditions, and many other disorders have been shown to be associated with omega- 3 fatty acids. This is not unexpected when we realize that omega-3 fatty acids are structural molecules in almost all tissues. EPA is highly unsaturated fat they contain 6 and 5 double bonds on their long structural chain. These polyunsaturated fats play a very important role with the function of our bodies. EPA is a vital nutrient and may be taken to maintain healthy function of the brain and eyes. Can be seen as a category of omega-3 fatty acids unto itself. It is these additional attributes that have many customers now looking to krill oil as a value-added component of a healthy lifestyle. The unique properties of krill oil and the potential to provide benefits that include those found in fish oil, plus those that are unique to krill oil. For this reason, we like the phrase "beyond fish oil." Beyond fish oil means that the inherent benefits of omega-3 fatty acids from fish oil are well documented and worthy of our respect. Beyond this, the composition of krill oil affords health benefits that are also rooted in sound scientific principles. For this reason, krill oil can be seen as a category of omega-3 fatty acids unto itself. It is these additional attributes that have many customers now looking to krill oil as a value-added component of a healthy lifestyle. Krill omega-3 fatty acids are bound to phospholipids, as opposed to triglycerides. Krill PL contain choline, a neurotransmitter precursor important to brain and muscle tissue. Astaxanthin, a naturally-occurring carotenoid molecule with powerful antioxidant activity. The recommended daily dose for each individual may vary with intended use. We recommend adults take 1 capsule a day with breakfast or for therapeutic results take 2 capsules a day with breakfast or as directed by your natural healthcare professional. Individuals frequently take more than 2 soft gels daily in an effort to provide higher amounts of each of the krill oil constituents. Higher dosing use has not been shown to be problematic, as current studies are investigating as many as 8 soft gels per day. What is so special about Tri- KRILL ™? Tri- KRILL ™ oil contains no less than 42% Phospholipids and 1500 ppm of Astaxanthin, the highest of any krill oil product on the market. Every batch is tested for contaminants and heavy metals. We feel we have set the highest standards for quality in our krill oil. It is also independently tested with 3rd party testing. How is Tri- KRILL ™ Oil manufactured? Our Tri- KRILL ™ Oil is manufactured at a state of the art manufacturing facility that has been working with nutritional lipids for over 12 years. This facility is recognized worldwide for its standards and the quality of lipids they produce. How is the Krill Oil harvested? Each trawler is allowed to harvest during the main season and only about 1% of the allowable limit is actually harvested. Krill harvesting is among the most regulated of any harvesting or fishing methods in the oceans. Is the krill population in the oceans sustainable? Our krill is made from Euphausia superb (Antarctic Krill). This is one of the earth's most abundant and sustainable organisms. Antarctic krill is the largest biomass on earth. The total quantity is estimated to be between 500 and 800 million tons. The weight of this biomass is almost double that of all the humans on earth. The krill harvest is well below conservative international catch guidelines. Most of the harvested krill is used for fish feed in salmon farms and the quantities harvested are less than 1% of the 1% harvested annually. Krill oil contains high levels of one of the most powerful natural antioxidants called Astaxanthin. Astaxanthin is a carotenoid molecule from the same family as beta-carotene, lycopene, and zeaxanthin, though astaxanthin appears to be more active in quenching superoxide, hydroxyl, and other radical species. Recent studies suggest that astaxanthin has anti-inflammatory action, inhibiting cytokine cascades in a number of trials of cardiovascular health, respiratory health, joint health, athletic performance, and others. Astaxanthins are what gives salmon its red color. Krill get their astaxanthin from small phytoplankton, their primary source of food. While krill contain natural levels of astaxanthin, we enrich our Tri- KRILL ™ with additional astaxanthin to the highest levels available. Our Tri- KRILL ™ contains 12 mg. of astaxanthin. This is in recognition of the tremendous antioxidant value astaxanthin adds to both product stability and clinical outcomes. Can people take Krill Oil if they are allergic to shellfish? Absolutely not. Talk with your physician if you suspect you are allergic to shellfish or fish. Some krill oil blends also contain some fish oil as a carrier, and fish can end up in the krill biomass as a by-catch. So, if you are allergic to fish do not take this product. What is Choline and what health benefits do we get? Choline is found in krill phospholipids as part of the phosphatidylcholine molecule. Choline is not found in fish triglycerides. Choline has critical functions as a precursor to the neurotransmitter acetylcholine. Acetlycholine is the neurotransmitter that is probably most well known for its involvement in Alzheimer’s disease. If we have adequate levels of choline, we support the acetylcholine neurotransmitter system, which protects attention, focus, memory, and even muscle function. Choline is also one of the body’s most important methyl donors, contributing one-carbon units much like folic acid and vitamin B12. The added benefit of choline in krill oil cannot be underestimated. In one recent study, 86.2% of female medical students and 90.0% of male medical students did not consume the recommended daily amount of choline. These amounts have been set by the Institute of Medicine of the National Academy of Sciences at 425 to 550 mg/day. Krill oil phospholipids provide additional dietary choline, which contributes to the daily need. Human clinical studies have demonstrated astaxanthin's cardiovascular benefit to include: a significant decrease in blood serum triglyceride and increase in HDL-cholesterol levels with corresponding increase in serum adiponectin, independent of age and BMI; significant increase in ankle brachial pressure index and a significant reduction in both systolic and diastolic blood pressure in healthy postmenopausal women; significantly increased peripheral capillary blood flow via human blood rheology; reduced lipid peroxidation in healthy non-smoking men, aged 19-33. In addition, pre clinical animal studies support the human findings as well as establish mechanisms of action. Human studies performed in both Japan and the US involving supplementation with AstaREAL astaxanthin demonstrated significant improvement in skin elasticity, increased moisture content and a reduction in the appearance of fine lines and wrinkles.